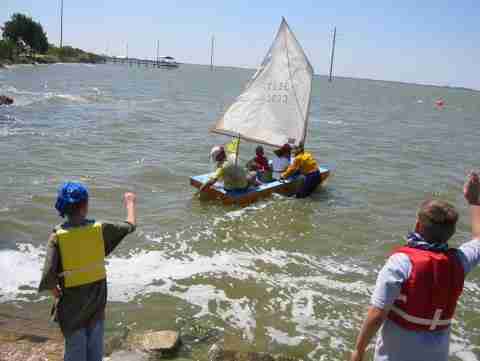 For two weeks 24 kids, aged 6 - 13 years old, built, painted, launched and sailed three 10-foot wooden sailboats while learning math, science, language arts, history, geography, art, music, windsurfing and more. "Any time we can get kids on the water it's a good thing, said Beth Winkler, an Olympic windsurfer who owns and operates Banana River Windsurfing Resort with her husband Greg, who is also an Olympic class windsurfer. "Sailing is sailing. Windsurfing, sailing, it doesn't matter. Start them out any way you can." Winkler participated in the workshop by teaching the kids about the wind and how a sail uses the wind to power the boats that the kids built. During the workshop the kids were treated to a windsurfing lesson with veteran windsurfer and traveling instructor Roger Jackson, who used Starboard boards and Sailworks sails to demonstrate the basics to the kids. Jackson also conducts clinics throughout the year at the resort and around the country. During the workshop the kids learned & practiced math skills, kept daily journals about their experiences, and got to learn the importance of teamwork, among other things. "Can we do two more weeks?" some kids and parents asked at the end of the workshop. Many thanks to Greg and Beth Winkler for hosting the workshop at their wonderful resort! The students at North Fork Elementary in Ft. Lauderdale, FL had a great time learning math, science, and language arts while building two sailboats for six weeks. Now that the caulk and paint have dried, the kids tested out their brand new vessels in the water at the Annual Waterway Cleanup organized by the Marine Industries Association of South Florida. 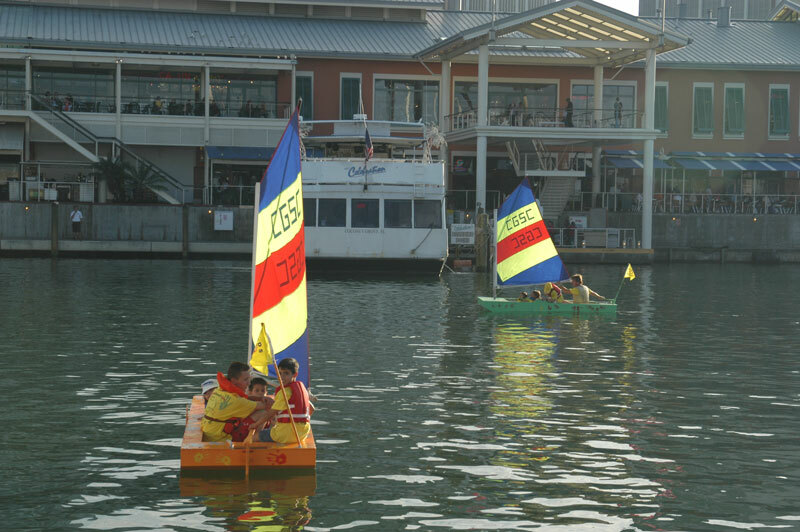 The kids built two 10-foot wooden sailboats at Miamarina at Bayside Marketplace during the 5 day Strictly Sail Miami boat show. Once again the kids attending the Miami International Boat Show & Strictly Sail had a blast at the Kids Aboard booth. 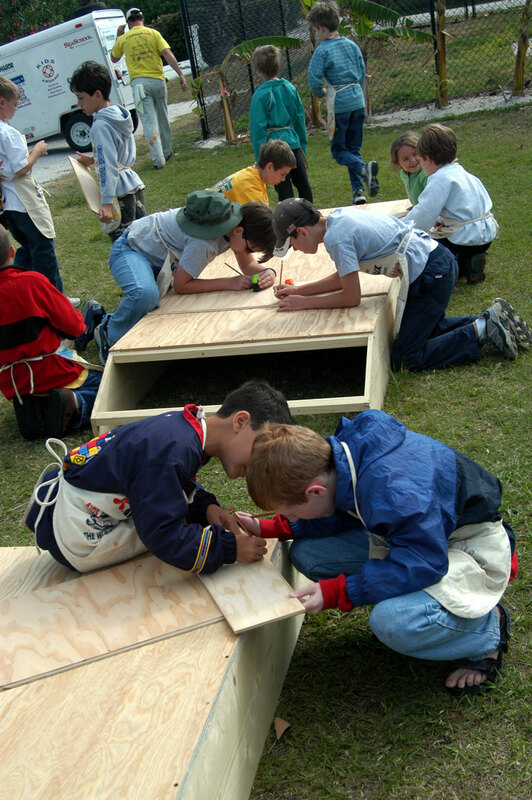 This year the kids built two sailboats and launched them on Monday, Feb. 16, 2004. The media came out with news crews and even a chopper to cover the launching for local TV! Many thanks to all the kids who participated, our sponsors and supporters who made the whole workshop a success for the kids, the parents, the vendors & the show organizers! 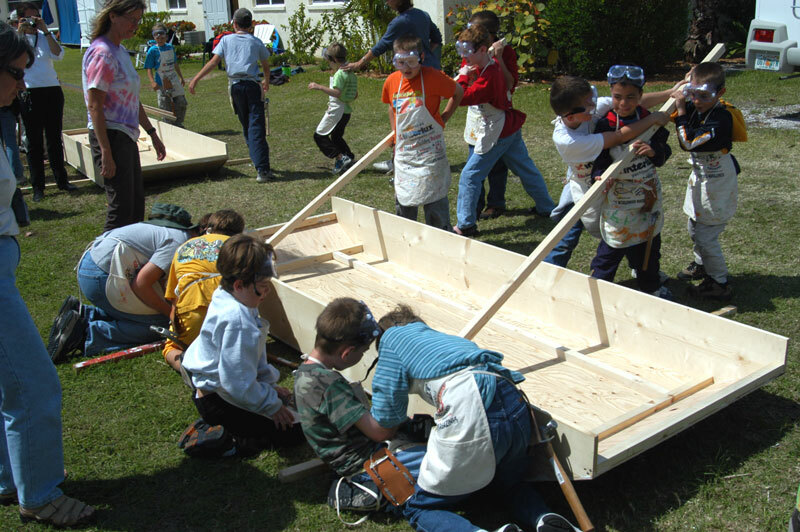 To see photos of the boat building, click on our Online Photo Gallery.